A series circuit is a circuit that has only one path for current to flow. Because there is only one path for current flow, the current (A) is the same at any point in the circuit. Voltage is the force that pushes the electrons through a resistance. The amount of voltage required is determined by the amount of current flow and resistance. The amount of voltage necessary to push the current through each resistor is known as voltage drop. 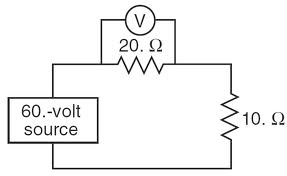 Voltage drop and be determined by placing a voltmeter across a resistor. In a series circuit, the sum of all the voltage drops across all the resistors must equal the voltage applied to the circuit. Because only one path exists for the current to flow through a series circuit, it must flow through each resistor in the circuit. Each resistor limits or impedes the flow of current in the circuit. Therefore, the total amount of resistance to current flow in a series circuit is equal to the sum of the resistances in that circuit. 1. The current is the same at any point in the circuit. 2. The total resistance is the sum of the individual resistors. 3. The applied voltage is equal to the sum of the voltage drops across all the resistors. The first step in finding the missing values in the circuit is to find the total resistance (RT). This can be done using the second rule of series circuits, which states that resistances add to equal the total resistance of the circuit. The total resistance is then used to find the Current of the circuit. Divide the total voltage of the circuit by the total resistance. Since the current is the same at any point in a series circuit, the voltage drop can also be determined for each resistor. 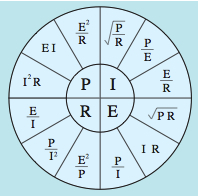 A good rule to remember when calculating values of electric circuits is that the total power used in a circuit is equal to the sum of the power used by all parts.